Tequila, orange juice, pomegranate juice, and Prosecco are basically all of the best drinks and they are all rolled into one delicious cocktail recipe! These drinks are super easy to make, but are really beautiful and look more impressive than a basic mimosa. They are perfect for a Sunday brunch or an afternoon bridal shower! I like using actual pomegranate juice instead of grenadine. It is less sweet and doesn't contain any extra sugar or artificial colors. However, you can use grenadine if you don't have access to pomegranate juice. Just be prepared that it will be sweeter than if you just use juice. As with any sangria or mimosa, the best juices are the freshest juices! 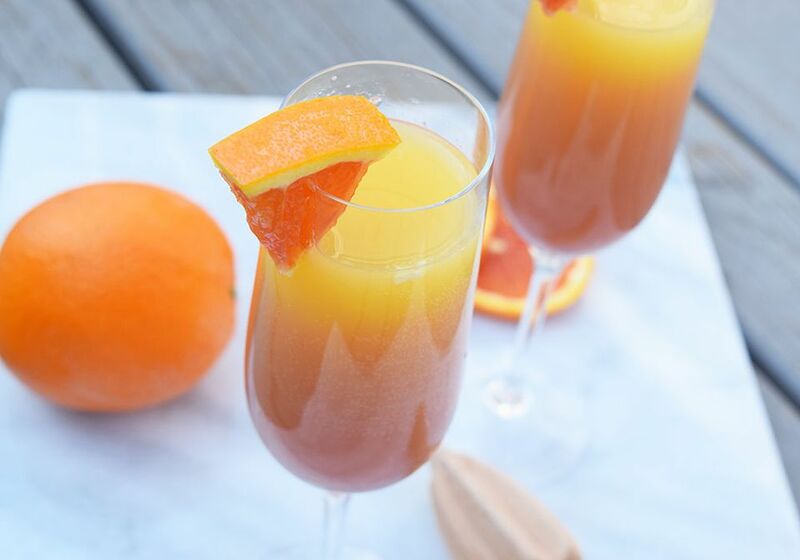 You can make this mimosa with store bought juice or with something you have freshly squeezed! You can use any kind of sparkling wine, prosecco, or champagne in this recipe. You can also substitute in seltzer for a virgin cocktail. You can also make this cocktail in a large pitcher and pour it to serve. Although, if you do this you will lose a little bit of the "sunrise" effect as you pour it! Cut an orange slice into four small wedges. Fill each champagne flute with 1 oz. of tequila. Pour the champagne or prosecco to about half of the way up the champagne flute. Fill the rest of the glass with orange juice, leaving a little room for the pomegranate juice. Add in the splash of pomegranate juice and the orange garnish and serve!